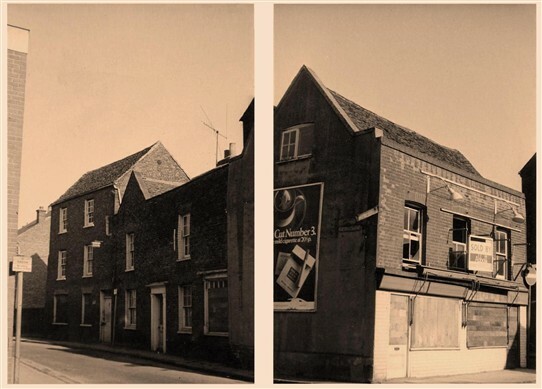 Two pictures together show the old butcher’s shop fronts and the old building at the start of North Street. The shops are for sale and boarded up. They still have the brackets from which meat & poultry would be displayed. This page was added by Nathan Bell on 12/04/2012. Mr & Mrs Horner were neighbours living round the corner in Hall Road and my parents knew them well with Doris often coming over to see my mother for tea. Horner's Corner was a colourful display of pheasants and all sorts of game hung outside with the slaughter house at the rear. Some may remember the escaped bull saga!? When the shop closed it moved into the Square where a butcher still runs a business today, although no longer Horner's. Raymond Horner was the last family member to run the business until he retired. They supplied meat to Connaught House (Roache Close). The boarded up shop front on the left next to Horners was Dickens. This was part confectionary/tobacconist also newspapers and at the back was a small lending library. The building on the right is now the cafe (which has an awning over the pavement).